Just like almost every exchange student, the moment I arrived in my American high school, I thought it would take me the whole year to make friends. Despite its hugeness, everyone knew one another already. I joined after-school activities and an internship program where I worked with kids as a volunteer, so I could make American friends. I went with my new friends to an American restaurant, where I had my first burger. They are pleased to hear all about my country and what life is like there! Making and hanging out with friends is the best thing to do if you don’t want to feel homesick. Life is so enjoyable when you have people to accompany you—no matter if they are your relatives or someone else. 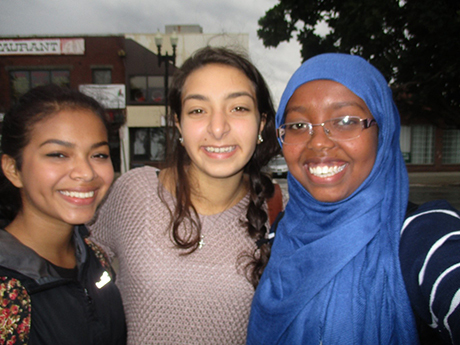 In the photo, I am posing with my American friends Fatima (far left) and Nada.